This is a simple test structure (with low build height) to test the handling of implicit intersections between solid lumps. This is a simple ladder structure with 10 rungs between two double rails. The rungs stick into the rails, and the double rails intersect length-wise. The path was generated by hand using the Berkeley UniGrafix language. 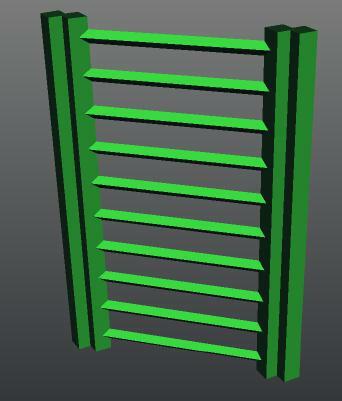 This part was specifically designed to test the handling of such implicit intersections by different slicing programs. The orientation, scale or strength of this model is not critical; it can be scaled so as to fit optimally a particular process or some remaining space in a run of a larger piece. The .STL files describe a part that 2" wide (in x), 4" long (in y), and about 0.3" thick (in z). Berkeley UniGrafix description of the knot (ladder.ug).